I have read and reread the instructions and tried multiple times to get my wife’s “groceries” list and my “groceries” list to sync but to no avail. Both phones have full version. 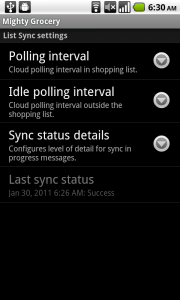 On my wifes phone her account is set to auto sync and on my phone my account is set to auto sync. 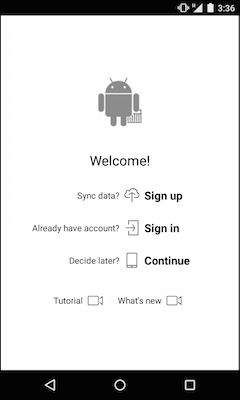 (I noticed on your sample above that illustrates the cloud actions the green box in the upper right say’s “active” not auto sync like our phones? When you go to ALL LISTS and then tap on the > to the right of the GROCERIES list Your taken to an edit list screen. This screen has a box that you can check with a choice of sync list via ?? You don’t explain what the correct choice is and there are multiple. Please point out what I’m doing wrong as this is a great ap and I would like to use it to it’s full poential. Hi Hugh, thank you for your question. FIrst of all, please make sure both your phones are linked to the same account. I.e. Account ID should be equal for records in Menu –> Settings –> Accounts. Second, I would recommend establishing link between shopping lists on your phones using these instructions. 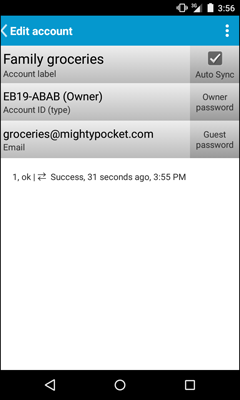 Given that you have already created account on your phone, you will need to push “Groceries” list to cloud from your phone, and then pull “Groceries” list from cloud on your wife’s phone. Please see Sync with cloud User’s Guide for more details. Finally, thanks for pointing out missing doc for Sync list setting of Edit list screen. This will be addressed shortly. I have 2 lists push to the clouds (Groceries and Favorites). The Groceries syncs fine but the Favorites does not. For instance, my wife adds an item from her phone and it would show on mine. However, when she deletes the item, it would remain on mine. Other than that, we love everything about it. Hi Bill, thank you so much for your feedback and your question. 4. Tap (>) next to Favorites. 5. Tap Sync list –> (your account) –> Favorites. If Favorites is not listed in #5, this means that it has not been pushed to cloud. Just push Favorites from your phone and try the steps above again. I did what you suggested but the issue remains. The issue only occurs while deleting. 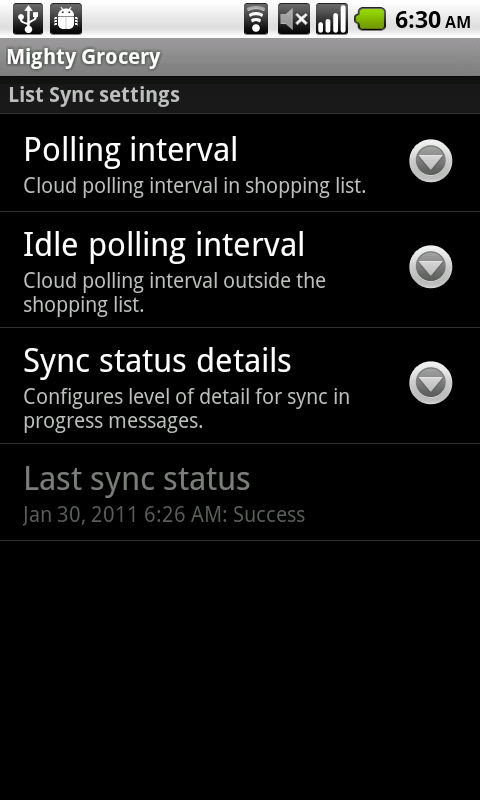 I can add an item from either phone and it would sync instantaneously. Also, it appears to affect only Favorites folder. Bill, thank you for trying the suggestion. Could you please send you Account ID to hi@mightypocket.com so we could investigate the issue. (both phones have Favorites folder Sync’d). 2. Create item –> item will sync. 3. Delete created item –> item won’t sync. Excellent product. Love it! I purchased the full version to sync to the cloud and share my list with my wife. Does she needs to purchase the application separately on her device as well? Hi Mark, thank you so much for your feedback and your question. 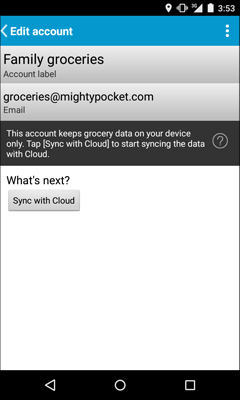 Yes, both phones need to have Mighty Grocery Full installed in order to have shopping lists synchronized. Kindly note that Basic Web UI will available soon, therefore it will be possible to populate shopping lists online using a browser. I have not looked at the plans section, but have you considered adding web support? So say I’m at work and my wife wants to send me a shopping list. That she would be able to log into an account put the list together and then when I sync my phone it would get the list from the account? Just curious as sometimes my wife can’t get a reliable signal on her phone at home. Yes, we are currently working on the Basic Web UI for the app which will allow online editing of shopping lists. Full-featured Web UI is planned later this year. Great app, perhaps in the future you might concider adding a calculator ability so you can ad the total expenditures for a month of purchases. This shure would help. Emery, thank you so much for your feedback and suggestion. We may be implementing suggested feature later on if we see more people interested in using it. My wife has scanned in a number of products to her phone over the past couple of months. Is there a way for us to sync this data between phones? Unfortunately there is no way to sync barcode data yet. However you may want to consider creating a backup from your wife’s phone and restoring it on yours. Beware that all grocery data on your phone will get lost in this case though. I guess we may consider syncing barcodes, history, etc. later this year if we see a demand for that. Thank you for your response Alex. I deal with various tech support departments from a variety of vendors on a daily basis due to the type of work I am involved in. Having done so now for over 10 years, it has become easier to recognize those who really care about their customers. Your devotion to repeatedly providing us (your customers) supurb and immediate service is most refreshing and greatly appreciated! Thank you again. Thank you so much, Steve. It’s my pleasure to be helpful. This would help to integrate the store’s published specials with the Mighty Grocery app… VERY valuable tool! Thanks for creating an AWESOME app! Hi Joyce, thank you so much for your feedback. Kindly note that we are going to give access to shared shopping lists through Web UI soon. So you will be able to access your shopping lists using a standard browser. Hi Joachim, thank you so much for your feedback and suggestions. Kindly note that Basic Web UI will be available soon which will allow editing shopping lists online. As to sending shopping lists via email just click phone’s Menu button –> Share under the shopping list in question. 2.95 canadian, what a deal..!! hey you guys, that is really unbelievable. With the cloud feature and all. By the way got it to work. guess your server was down…. You have got to charge something for this. Server costs and all. I am realistic, and do realize that you have to sell it and get the clients to make it work. But at least lets start a donation program or something. Hi Mike, thank you for you feedback. I am glad that cloud sync feature worked for you. Today we had upgrades applied to our backend systems before the upcoming release which could cause temporary connection difficulties. Sorry for inconvenience and thank you for your patience. When I use back up with cloud, does that mean that everything I have done will be saved if I get a different phone or is it just the lists that get backed up? Also, is there any way to get a bank of of brand name products to choose from in pick list (eg, Motrin, Tide, etc)? Christy, thank you for your question. Yes, backup feature stores all your data and settings on cloud excepting account list (Menu –> Settings –> Accounts). So if you get a different phone you will need Account ID or email + Owner password to restore all your data. As to brand names, unfortunately there is no such a bank yet. However you may want to try barcode scan feature which should return most of popular product names. Barcodes can be scanned directly in shopping list, or in Pick list settings (Menu –> Settings –> Pick List –> My Picks). Hi Yuriy, thank you for your feedback. I have to admit that our app still have bugs to fix. Evidently, that’s one of the reasons why we still keep “Beta” word in the version label. Anyhow, we do our best to identify and resolve any issues our customers may have. That said I will appreciate any details on steps to reproduce the issue so we could eventually fix it. Sorry for inconvenience and I look forward to hearing any details you would like to share with us. Many thanks for your quick response via email for this problem. Still don’t know why it suddenly turned into german but uninstalling seemed to help. The file was definitely uninstalled but still showed installed on google play (via pc) but not on phone version of google play so I just reinstalled it via phone (it now though shows it is not installed on PC google play – go figure lol)!!!! But anyway all back up and running many thanks. Have another question but will do this under the right category this time – re pick lists!